BOSS RC-1 new pricing graphic. 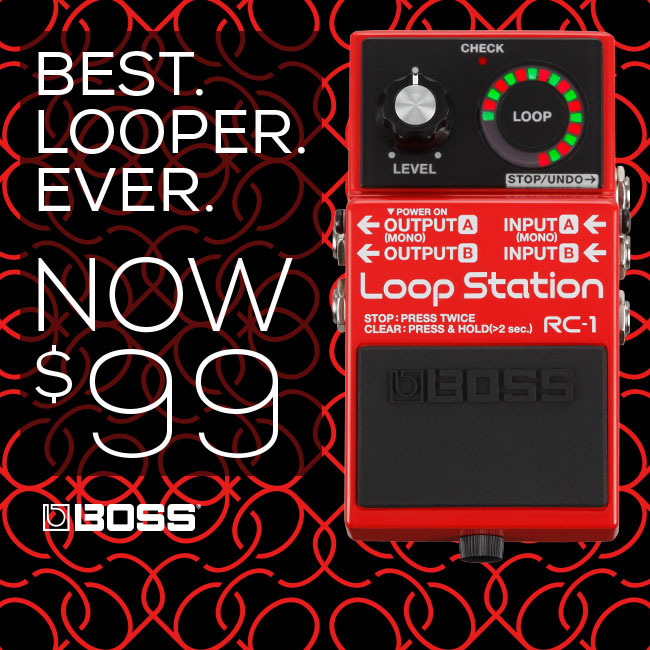 Los Angeles, CA, April 23, 2015 — BOSS offers convenient, high-quality looping at a more affordable price with the RC-1 Loop Station––now available for a U.S. street price of $99.00. The battery-powered RC-1 is the entry-level model in BOSS’s acclaimed lineup of dedicated loop recording devices. Its straightforward operation makes it easier than ever for guitarists, bassists, and other musicians to incorporate the fun of looping into their live performances and practice sessions. Designed with guitarists and bassists in mind, the RC-1 sheds the more complex features found in some other Loop Stations, offering a straightforward approach that will appeal to both beginners and advanced musicians who like to keep things simple. The RC-1 provides instant musical satisfaction and creative enjoyment. Housed in an ultra-durable BOSS compact pedal case, the streamlined RC-1 lets players experience the fun of spontaneous loop creation with no complicated controls or features. Loop recording is intuitive and hassle-free––record, overdub, play/stop, undo/redo, and clear operations are all accomplished with one integrated pedal, while the loop level is controlled with the panel’s single knob. The unique circular loop indicator features 24 multi-colored LEDs for instant visual feedback on the operation mode and cycle status of the current loop. The RC-1 offers high-quality sound with up to 12 full minutes of stereo recording time. The last loop session is stored in memory after power-off, so players can recall performances at their next practice session or gig. The pedal can be powered with an optional PSA-series AC adapter or a single 9-volt battery. Up to 4.5 hours of battery operation provides great convenience for street performing, open-mic nights, and other mobile playing situations. As with other compact BOSS pedals, the RC-1 integrates easily onto any pedalboard. Dual inputs and outputs let guitarists and bassists with sophisticated effects setups loop in true stereo. Stereo operation also allows synth players to loop without sacrificing the rich, full stereo sound of their instruments. By using just one input and output, the RC-1 can be used in a standard mono rig as well. Photo caption: BOSS RC-1 new pricing graphic. For high-resolution images of this product, please visit http://www.RolandUS.com/Media. For embeddable videos, please visit http://www.YouTube.com/BOSSchannel. BOSS, a division of Roland Corporation, has achieved legendary status among guitarists by offering a diverse, world-leading product lineup that includes compact effects processors, multi-effects processors, digital recorders, rhythm machines, metronomes, tuners, and more. For more information, visit http://www.BOSSUS.com.